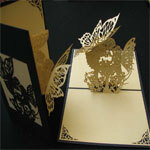 Popular three dimensional handmade Gift Cards with various cut out designs. Most are blank with no text and good to use for any occasion. Pop up cards are exclusive to Botanique Florists Gold Coast, add to flower order for delivery today to Gold Coast localities or post to any postal address in Australia with Australia Post. Allow 5 working days for Australia Post. Card Message Inspiration and Suggestions. *Also buy these cards in gift wrapping options when checking out.